Based on the first novel of the Die Zwerge tetralogy [Eng. 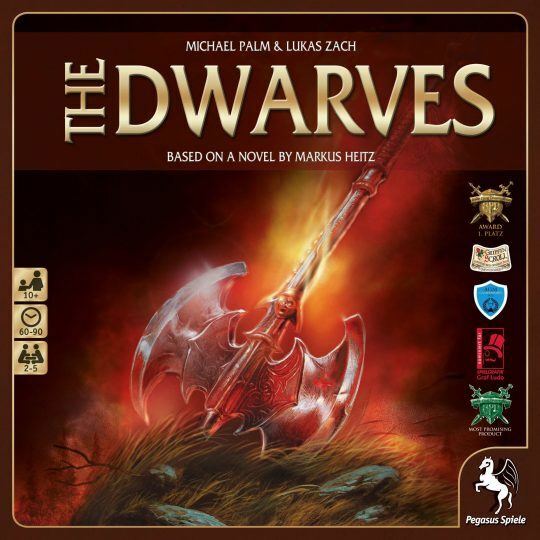 The Dwarves] by author Markus Heitz, the goal of the cooperative game Die Zwerge is to keep evil from flooding Girdlegard. During set-up, players choose one of the dwarves from the novel, each of which is equipped with a unique special ability and different stats for fighting, crafting, and movement. Fight against the advancing enemies (orcs, trolls, and älfar [Ger. albae], i.e. dark elves). Lobby the dwarven council to give advantages to all players – and without the favor of the dwarven council, everyone suffers disadvantages. Solve a minor quest for rewards. Take on the current major quest, revealing the next major quest if successful. Completing these quests is the only way to win the game. For most of these actions, a player must succeed in a dice-driven challenge. If the players cannot control the flood of evil while simultaneously solving the major quests in time, they will lose. A3 poster "The smiting of Keenfire"